I've never been to San Francisco before. Okay I lied. I went once before with my parents, when I was like 7 years old, and probably didn't even realize I was away from home. So when my boyfriend suggested we take a vacay out to visit some friends, I excitedly agreed and sneakily started planning which destination race I would squeeze in while we were out there. One quick Google search later, I decided the famed SF Half-Marathon would be my very first destination race! Given that the race was on a Sunday, we flew out to 'Frisco on the Wednesday before. Technically the primary purpose of this trip was to reunite with old friends, so I obviously had to raise a glass to the occasion. Well, more like 4 days worth of boozing. 🙈 But you know what: I'm not ashamed to say I broke my cardinal rule of partying before a race, because we created some memories, y’all. 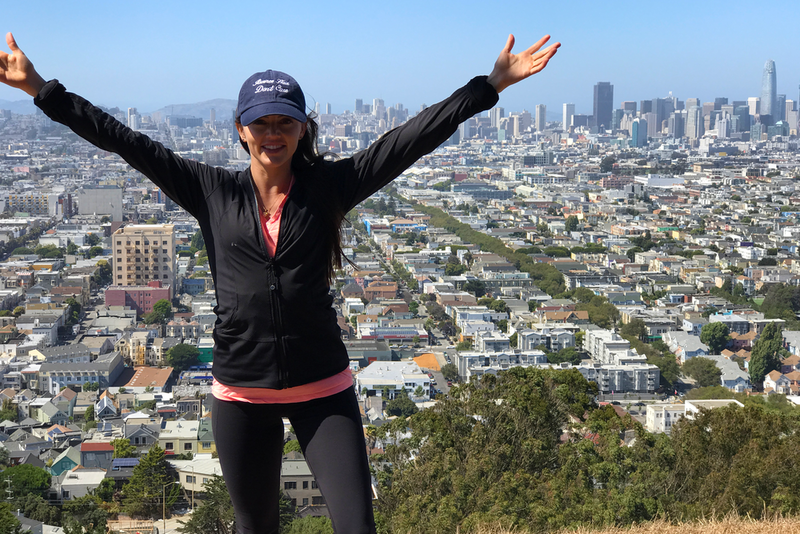 We strolled in picture-perfect Sausalito, hiked amongst the redwoods in Muir Woods, window-shopped in Union Square, hit golf balls on the most scenic driving range ever, tanned in Dolores Park, spent way too much time at the race expo, and cheers-ed in at least 10 of the city's hottest bars. So basically, I had the ultimate pre-game to get me pumped for Sunday morning’s race. The only thing I wasn’t pumped about come Sunday morning: my 4:00am alarm clock. You read that right. 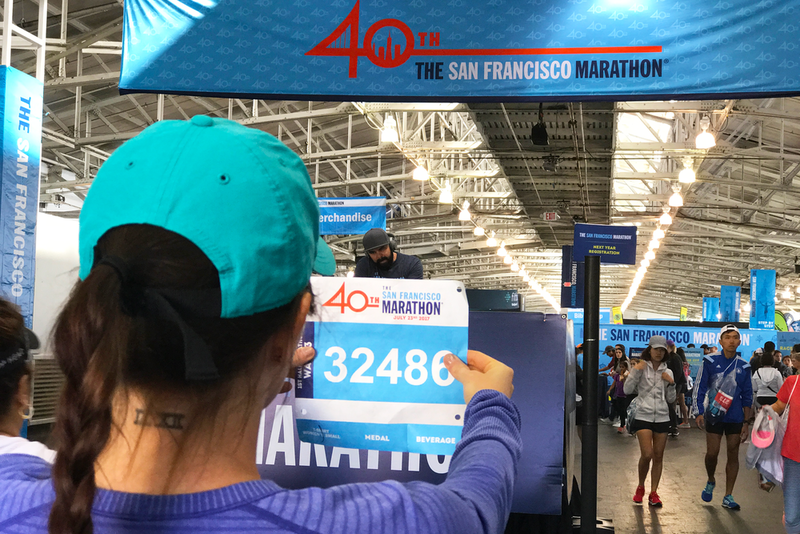 I had only 5 hours of sleep the night before the San Francisco Half-Marathon. That’s why I don’t remember one second of the hustle to the starting line. But when I did finally wake up from zombie mode, there I was: standing amongst 7,500 other anxious runners who were ready to conquer the hilly course that laid ahead. We squeezed into our designated corrals and gawked at the beautiful Bay Bridge that lit up the dark sky just for us. You would've never guessed that it was 5:00am though (apart from the nighttime sky), because with “Uptown Funk” blaring through huge speakers, everyone was energetically hopping around to the beat and the whole city was hyped up for this long-anticipated event. What seemed like only seconds later, the race emcee excitedly announced that it was Wave 3’s time to take off. The race volunteers ushered our corral up to the starting line, and then the whole block excitedly counted down in unison like it was New Years Eve. When we heard the obnoxious foghorn go off, we sprinted across the glowing starting line and down the famous Embarcadero. The first three miles were a breeze. The cobblestone streets were flat, the cool temperatures were refreshing, and I was totally distracted by the most breathtaking sunrise that matched the neon gear of my fellow runners. 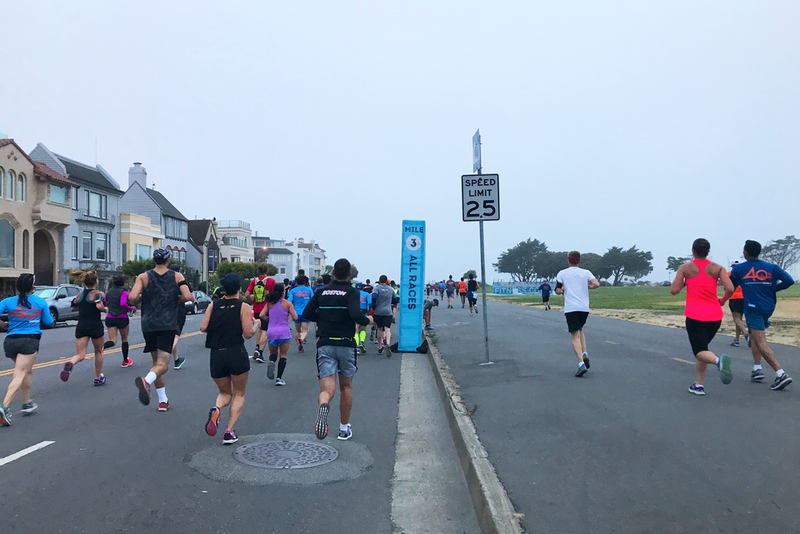 The course gave us a scenic waterfront tour of the Bay and the infamous Alcatraz, and led us towards that ominous fog that hid the Golden Gate Bridge in the distance. But when we turned inland at mile 5, we were greeted with our very first climb. In fact, it was a mountain of a hill and it was payback for the leisurely ride we enjoyed so far. When we finally reached its peak, we made a sharp right turn and found ourselves taking the first steps onto the remarkable Golden Gate Bridge. Too bad we couldn't actually see it though. Because Karl the Fog was on his A-game, and you literally couldn't see 20 yards in front of you, much less the big red arches in their full glory. But the one thing I did see: the 100+ elite runners already lapping me on my left because they conquered this lengthy bridge in a matter a seconds. Me? I was over to the right swimming through the freezing rain that Karl was sloshing in my face. I was starting to shiver, my legs were losing their fight, and the only thing propelling me forward was the fact that I was dead center in a swarm of runners who were wrestling to get to the end of this obstacle. No stopping and no turning back now. When we finally reached the end of the north side of the bridge, the clouds opened up to reveal the most heavenly sight of Vista Point. The fog on this side of the bridge turned into cotton candy and the beautiful pastel blue sky made me completely forget about my achy knees. It was our reward for overcoming the first half of the journey, and it was the relief I needed to keep pushing on. After we snagged some Nuun electrolyte water and GU energy chews at the nearest water station, we made a U-turn and headed back towards the city to battle the bridge once more. That final 5k tested me in every way. My legs were losing life, my hips were killing me, and I was even feeling a bit delirious. But when my Runkeeper app finally chimed that I hit the 13-mile mark, I decided to give it everything I had left. I picked up my pace into the final few yards, smiled when I heard the familiar voices of my best friends cheering in the crowd, and sprinted as hard as I could across that bright blue finish line. No lies: this course was a doozy. It really tested my endurance and left me feeling super disappointed with my time. And to be truthful, halfway through the course, I started cursing myself for not taking my pre-race hydration and rest more seriously. I knew I could’ve had a killer performance, had I not indulged the days leading up to this moment. I can honestly say that this San Francisco Half was more than I ever thought it would be. Sure, it was just as tough as the locals had warned, but I definitely wasn't expecting it to fly by as quickly as it did. The course was breathtakingly scenic, the race was flawlessly organized, and locals were the best cheerleaders a runner could ask for. If you've never been to San Francisco before, or are simply looking for an excuse to get some more miles under your shoes, I say you book a flight out for this one. You won't regret it.